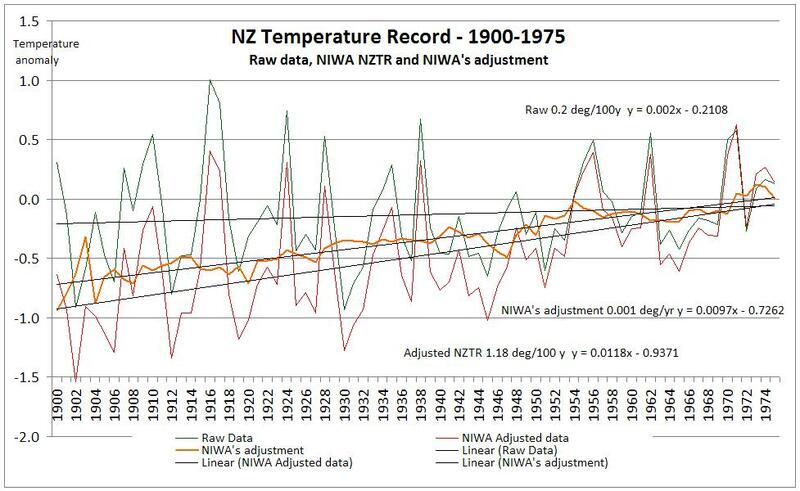 The “Seven-Station Series” (7SS) constituting the official New Zealand Temperature Record (NZTR) is analysed and compared with the Southern Hemisphere (SH) temperature record using an interesting new data analysis technique called Empirical Mode Decomposition (EMD). Analysis of temperature trends usually employs extrinsic data smoothing techniques such as regression, moving average and Fourier filtering, but there is a more appropriate technique available. Empirical mode decomposition (EMD) is an intrinsic data analysis technique now being used across a number of disciplines, including climatology. You can find out more from these two background papers: On the trend, detrending, and variability of nonlinear and nonstationary time series (Wu et al., 2007)(pdf) and Analysis of Temperature Change under Global Warming Impact using Empirical Mode Decomposition (Molla et al., 2007)(pdf). If you want to study EMD in detail, there’s a lot of help available — even a free command line utility. EMD uses a sifting algorithm that filters the data until an overall adaptive trend (monotonic residual) is revealed. 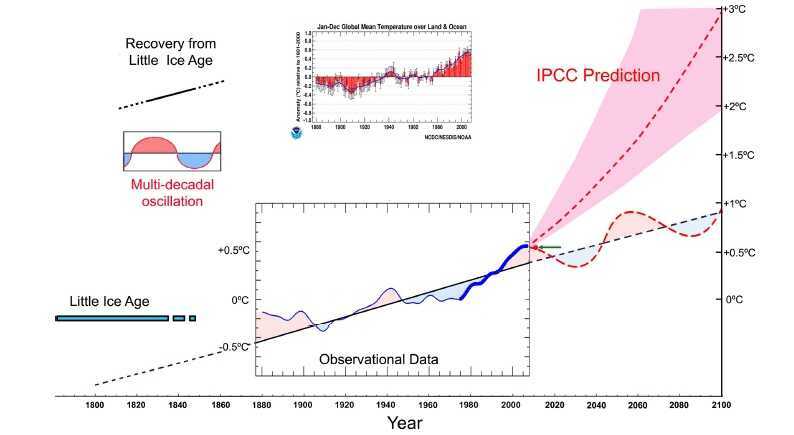 The first paper linked above shows how a decadal trend was also extracted from the global record but the 100-year 7SS time-frame used here is too short to do the same. A longer 7SS record would probably reveal an intermediate decadal trend similar to that presented plus an overall trend that cannot be extracted (by this author) from the 7SS at its current length. The SH normal climate of 0.14 °C/century in this analysis is the Southern Hemisphere (SH) component of the 0.5 °C/century global recovery from the Little Ice Age (LIA) (Akasofu, 2010). In lieu of any component already established that is to date unknown to this author, the SH component was arrived at by two different means: north/south landmass distribution (39:19) and north/south decadal temperature trend (0.21:0.08 °C December 9, 2010). The trend starts at the global average temperature of 13.6 °C in 1850. The Akasofu graph. Click for larger version. 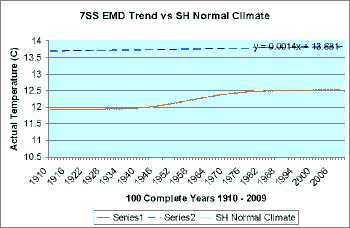 The EMD comparison of the NZ 7SS and Southern Hemisphere temperatures. The first and lowest 7SS EMD data point at 1910 is 11.93 °C, the last and highest is 12.54 °C at 2009, so the temperature rise from 1910-2009 is 0.61 °C in total. Of that, 0.14 °C is attributable to normal climate, leaving a rise of 0.47 °C unaccounted for. 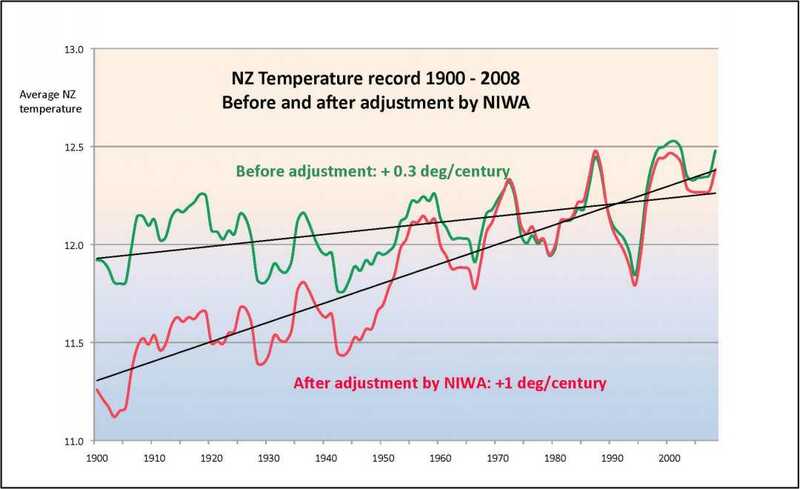 It should be noted that the 0.61 °C rise is considerably less than the 0.91 °C/century warming promoted by NIWA but arrived at by linear regression. A) Unnecessary adjustment of raw data. B) Urban heat island effect (UHI). C) Part of a multi-decadal cycle. D) Combinations of A, B and C.
As a trial, the values of two cool year extremes, 1912 and 1930, were removed from the input dataset and replaced by a duplicate of the previous year’s values (1911 and 1929 respectively). In other words, smoothed — the emd.exe utility does this automatically when data is removed. 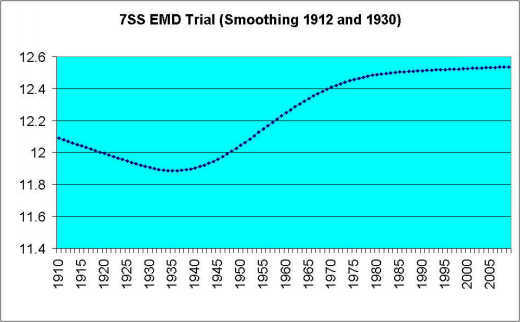 Two other trials were run where, first, 1912 alone was removed, then 1930 alone was removed, but neither changed the general shape of the EMD trend in the way that removing both did, which appears somewhat counter-intuitive. No conclusions should be drawn from this experiment unless the reader has complete mathematical understanding of the EMD algorithm (something this author certainly does not have yet). 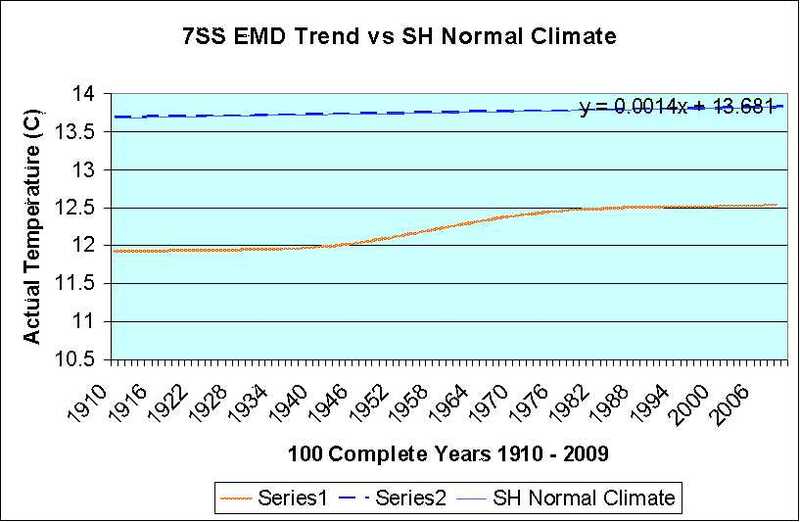 The EMD comparison with the anomalously cool years, 1912 and 1930, removed. It’s worthwhile reading this post in conjunction with the previous post “NIWA generating warmth”. The record talked about there started at 1900. I had previously confused this with the 11SS but now know better thanks to Clarence. What strikes me about the second (lower) plot 1900-1975 is that the raw data has a linear rise of +0.2 C/century. That’s very close to the +0.14 normal climate in the post above. And the upper plot of 1900-2008 showing +0.3 C/century in the raw data is not that far removed either. Wow. I took out 2 anomalously cold years, 1912 and 1930. Ran the analysis again and the software duplicated 1911 for 1912 and 1929 for 1930. The shape of the EMD trend changes radically. The new starting data point at 1910 is 12.09 (11.93) and there’s a nadir at 1935 of 11.89 (11.96). The EMD curve looks more like a multi-decadal cycle oscillating 0.3 C below then above 12.2 C.
If temperatures for the next decade 2010-2019 continue the downward trend of the 2000-2009 period then the cycle will be more pronounced (better defined). I can do an update plot for anyone that’s interested. I’d be interested to see that, because with only 7 stations, anomalies such as 1912 and 1930 will have larger effects than they warrant. For example, if one of them occurred after the mid-point of the time domain, instead of both before, presumably it would provide some measure of cancellation. It’s basically a crude sensitivity analysis, but it could be useful. I will run it again but leave 1930 as is and just smooth 1912 to see what happens before I send an update in. 1912 is by itself but there are other cooler anomalies close to 1930. Smoothing either 1912 or 1930 individually doesn’t change the general shape of the trend much from the original. But smoothing both 1912 and 1930 makes it radically different. I don’t know enough about the EMD algorithm yet to say why but I’ll send in an update with both 1912 and 1930 smoothed. There’s definitely a sensitivity involved that I don’t understand. 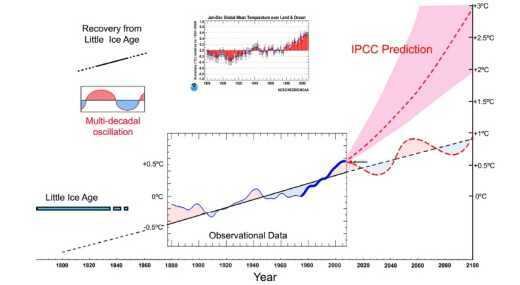 The climate patterns are described for three periods within the 1930–1994 record, with change-points around 1950 and 1975. In the first period (1930–1950) New Zealand’s climate was cooler, and the prevailing west–southwest circulation was stronger (as noted by Salinger (1979)). By contrast, national average temperatures increased by about 0.58°C in the second period, and there was more airflow from the east and northeast [1950-1976]. The last period (1976–1994) was one notable for frequent El Nin˜o events and comparative lack of La Nin˜a episodes. New Zealand-wide temperatures maintained their level of increase from the first period, in spite of more frequent airflow from the southwest. This is consistent with the EMD analysis and C). Longer term temperature records show this temperature increase amounts to 0.8°C since the beginning of the century. Given the 1999 paper date, they are referring to the period 1900-1994 or 1999. The RPC scores on each month were averaged over the January–December period to give annual scores. A 10-year Gaussian filter was used to smooth the annual values to produce time series to depict longer time scale trends and variability. I’d like to know a lot more about the period 1900-1930 but from 1930 onwards there’s very little difference RPC vs EMD. 0.7C fall in 2010 Australian temperatures – put that in the context of a century time-frame. Interpreting the 0.7C fall in 2010 temperatures. Those familiar with the climate debate will naturally be aware that the rise in average official temperatures of 0.74C over the 20th century was an inherent component of IPCC’s conclusion of a future of dangerously high temperatures unless governments acted to reduce greenhouse gas emissions. But how to interpret the fall of 0.7C in the average Australian temperature for 2010?